One in 10 Australian women will develop breast cancer. The National Breast Cancer Foundation tells us that 89% of these women survive beyond 5 years, but still, on average seven Australian women die of breast cancer each day. Much of the improvement in survival over the last decade has come from early detection through services such as Breastscreen. However, Angelina Jolie recently brought to public attention the plight of some women who are almost certain that they will get breast cancer before it could ever be detected by a mammogram. After preventative surgery to remove her breast tissue, Angelina wrote of the fear and powerlessness that comes from knowing you have the ‘breast cancer gene’. This included watching her mother succumb to cancer at the age of 56. So what does it really mean when someone says they have “breast cancer in the family” and does genetics cause all breast cancer? As a cancer researcher this is always one of the first questions I am asked. It’s easy to answer: a whole lot of bad luck. This is not always a satisfying answer, given most people have read newspaper headlines like, “Obesity-linked cancer on rise” or have seen graphic images of tumours linked to smoking on cigarette packets. Yet we also hear of stories of smokers who live to 100 and overweight people with no signs of ill health. The reason for this is that things that “cause cancer” actually just amplify your risk – or to put it simply, make it considerably more likely you will have bad luck. So why would a scientist discuss a concept as vague as luck when talking about a disease as serious as cancer? Because, luck in this case governs the processes that I study in my laboratory – the process of DNA damage. Every cell in your body contains a copy of the DNA that you inherited from your mother and father. Each time a cell divides the DNA has to be copied and sometimes, if the DNA is damaged, it is copied wrongly. These incorrect copies are called mutations. By “bad luck”, some of these mutations lead to the cell losing normal control – and a cancer is born. This is a background risk that really can’t be attributed to anything other than just being alive. But on top of this, things like tobacco smoke, UV from the sun, ionizing radiation and being overweight cause cancer by increasing damage to our DNA and therefore increase the probability (a more scientific word for luck) of cancer. Breast cancer originates from a single normal breast cell that has accumulated DNA damage, leading to a loss of control over cell growth. A normal cell is programmed to stop growing when it encounters the cell next-door, but DNA damage can corrupt this program so that the signal to stop growing is lost. This cell then divides, its daughter cells divide, and so on, until there is a clump of cells that form a tumour. Each tumour cell originated from that one rogue that has now perpetuated its mutant program. These cells can also gain the ability to escape from the breast tissue and grow in other parts of the body. This spread, or “metastasis”, to places such as the liver, brain and bone is the ultimate cause of most breast cancer mortality. So things that cause DNA damage will increase the probability of breast cancer by turning a normal cell into a disease that can invade other organs. It seems that one reason breast cancer is more common than other forms of cancer is that the hormones that regulate breast development, such as estrogen, are a promoter of damage to DNA. Pregnancy is associated with a decreased risk of breast cancer, by somehow playing a protective role in preventing mutations accumulating. But this hasn’t yet explained why one family has more “bad luck” than the next. Breast cancer families have two or more siblings or three individuals across several generations that develop the disease. And it often appears at a young age. How do you inherit luck? Genetic analysis of breast cancer families led to discovery of the breast cancer genes (called BRCA1 and BRCA2) in the mid-1990s. After 20 years of intensive research we now know that these genes play an important role in fixing DNA damage. They regulate DNA repair, the process that finds damage and fixes it. In families with a faulty BRCA1 or BRCA2 gene, this DNA repair process is less efficient and DNA damage accumulates more quickly over time. 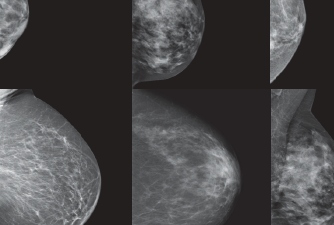 All this extra DNA damage increases the probability of developing breast cancer – it’s like an amplification of all the normal risk factors in one hit. So faulty BRCA1 or BRCA2 leads to a 70% lifetime breast cancer risk – seven out of 10 of these people will get breast cancer: not great odds. Interestingly, these genes are also linked with higher ovarian cancer risk, perhaps suggesting a special role in protection from DNA damage in estrogen-sensitive organs. How much of cancer is genetic? A recent overturning of a patent that covered BRCA1 means that testing for the faulty gene should hopefully become more accessible. However, this will only help the small percentage of women who have inherited harmful mutations in these genes. The remaining 90-95% of breast cancer cases are not due to inheritance of faulty genes. When high-profile young women like Kylie Minogue and Angelina Jolie bravely share their breast cancer stories in the media there is a surge in awareness but also potentially a corresponding rise in fear. By simple rules of statistics an individual can have several relatives with cancer without being linked by a genetic basis. This is a major cause of the public’s overestimation of “cancer in the family”. Despite their newfound infamy, faulty BRCA1 or BRCA2 are not the only genes that cause familial breast cancer. There must be other genes! Work in laboratories worldwide, including my own at St Vincent’s Institute in Melbourne, is proving that the majority of these other genes are also involved in fixing DNA damage. And this gives us hope that we can turn this feature into a weakness, and actively begin to target family-associated cancers with new specific chemotherapies. PARP inhibitors are one such class of drug, being trialed in treatment of breast cancers in BRCA1 carriers. They kill cancer by overwhelming the residual DNA repair ability of tumour cells from these patients. These drugs are a major success story of modern cancer research and have limited side-effects in many BRCA1 patients. Currently these drugs are only utilized in treatment but not prevention of cancer. Angelina Jolie identified a faulty copy of BRCA1 as her burden and decided on a preventative double mastectomy. Explained simply, she opted for this radical procedure based on the fact that you can’t get breast cancer if you don’t have breasts. Singer Melissa Etheridge, who was diagnosed with breast cancer in 2005, also carries the BRCA1 mutation but has elected instead for regular breast screening to allow prompt detection and intervention. Preventative surgery and high level screening have both been proven to work in reducing cancer risk. However, a proactive measure – non-surgical prevention of a tumour in the first place – is the ultimate goal of researchers like me and my colleagues at St Vincent’s Institute. Because in an ideal world, we would not only have a genetic test that predicts when a woman is at high risk of developing breast cancer, but we would be able to give those women an option that does not involve radical surgery. Dr Andrew Deans returned to SVI after carrying out his postdoctoral studies at Cancer Research UK, the largest independent research organisation in the world dedicated to fighting cancer. He is currently head of SVI’s Genomic Stability Unit and a Fellow of the National Breast Cancer Foundation.